What is a dual frequency card? Dual Frequency Cards are cards that hold both low frequency and high frequency chip (or 2 high frequency chip) in a single card. Can I use dual frequency cards with Suprema devices? If you try to use these cards with Suprema devices that has the capability to read both card types, you will run into issues. If you try to read a Prox + iClass card with W2-OAP, the device would not know which frequency to read because it has the ability to read both card. Hence the device will read the Prox card at times and iClass at other times, resulting in inconsistent authentication results. In example, if you registered the user with the iClass card and you tried reading the card, the user will have up to 50% chance of having authentication fail event when the Prox card is read instead. 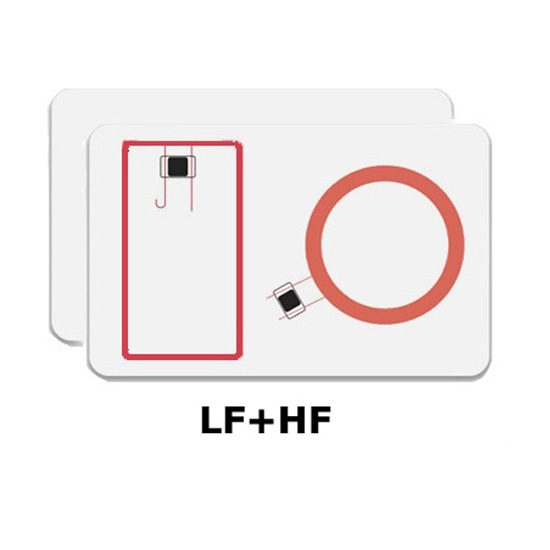 Note: Suprema devices with dual-frequency read takes turns reading HF and LF in the backend. Hence this means your authentication result will not always be 50/50, because it matters in which read cycle you scanned the card. In a future version of the software and hardware, we hope to implement a feature that would only allow one frequency read to avoid such issues. For now you can request a customization project (if you are a Suprema Authorized Distributor) to customize the firmware to only read one frequency. How do I know if I have a dual frequency card? If you're using a HID manufactured card, all dual frequency cards have "Px" written on the surface of the card.